One of adidas‘ best-loved silhouettes, the ZX 9000 has released in an OG colorway that should thrill fans of the classic kicks. In an icy-cool Hydra/Turquoise color scheme, the bring-back style boasts suede and mesh uppers, along with yellow midsoles and red, white and blue accents. adidas’ Torsion system and Purolite cushioning tech, meanwhile, work as well today as they did in 1989, offering all-day comfort and support in an iconic package. 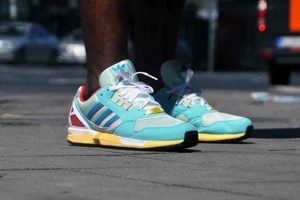 Look for adidas’ Fall/Winter 2013 ZX 9000 OG now at retailers like afew-store.